Transcribing is THE WORST... just the worst. If we had a nickel for every time someone at a conference talked to us about the perils of audio and video transcription…well, we would be very rich. But, since it is rare for anyone to actually give us nickels for these interactions, we decided not to purchase our own company yacht (just yet) and instead chose to write a blog that might help ease the woes of transcription via the power of software…and no, it's not our software. Well…not entirely. Sometimes, transcribing everything for a qualitative data analysis is not really necessary. When this is the case, we recommend that you first try excerpting and coding only the necessary tidbits. In Dedoose you can excerpt and apply codes to a video or audio stream directly. Then your research assistant (or you - with your research assistant hat on) can transcribe the audio right inside Dedoose for only the pieces of media that have a chance of being used in your study (that which you excerpted and tagged). The other scenarios… Yet, sometimes we fall into dreadful times…times when we have to transcribe our entire interview. Before bringing out the old transcribing pedals, or playing the same five seconds of media 20 times to get half a line on the page, think about these options instead. Professionals: Hiring a professional can be expensive, but it takes you completely out of the process saving you loads of time. The expense typically makes this cost prohibitive to the majority of our users who aren’t operating with a big budget, but is a valid option and should be mentioned. Your library should have local resources to help you hire a pro. Dragon Speak: Auto-transcribing software has come a long way so if you have about $150 and are working with mostly simple interviews this software could help take the burden completely off of your shoulders. The one downside (other than cost) is that it cannot detect multiple speakers. So, you might have more work cut out for you than you think. Isn’t there a free option for my qualitative data analysis? This is where Audacity comes in. Audacity is a free downloadable software that allows for some pretty complex sound editing. But here is what is helpful to transcribers…when you listen to the audio stream from an audio or video file you can change the tempo of the interviewee’s voice. By slowing the tempo of the voice down, you can actually type somewhat more comfortably while the participant is speaking. Since we are often asked for a free option we have walked through the process of slowing the tempo of a file in Audacity below. Audacity is available for Macs and PCs alike and it is free. Here is the link: http://audacity.sourceforge.net/. Go to File, and select Open from the menu. Choose the video or audio file you need to transcribe. For videos, you will not see the video itself but rather the audio associated with the video stream. A double click on the squiggly audio lines will select the whole file and turn the light gray a dark gray color as shown below. Slow the speed down by moving the bar to the left into negative numbers. Some people (like many of our staff) talk extremely fast. So slowing the tempo of their speech would likely require a more extreme setting. Since everyone is different, you can preview the sound at a certain tempo by pressing the ‘Preview’ button. 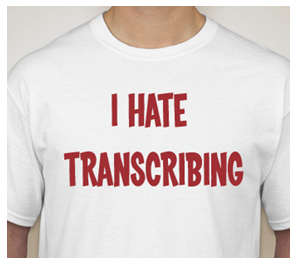 Get transcribing: Now that your audio is ready, open a word document and start transcribing! As you hit play on your media file you will find that you can type as the file is playing. 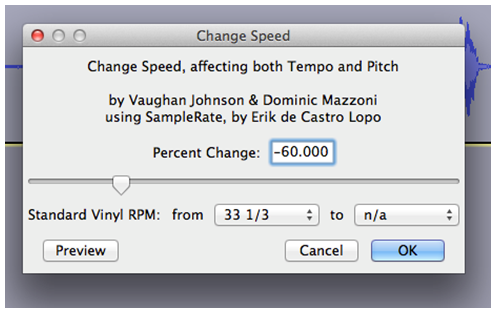 If you cannot keep up, simply change the tempo once more to allow the sound to play even slower. And when you are finished with your transcript, you can upload into Dedoose to complement your video or audio file.